When we previously posted on the upcoming release of 2011 Topps Football there was a level of uncertainty as to whether we would even have an NFL season this year. A lockout of 18 weeks ended on July 25th, giving us a glimmer of hope that we will shortly see the hard hits and majestic spirals being tossed towards the endzone. Even through all of this uncertainty, Topps has still persevered with the newest offering of their football staple. And they've had a tough road to go down, since there have recently been unprecedented free agent signings and trades made during this lockout-shortened off-season. 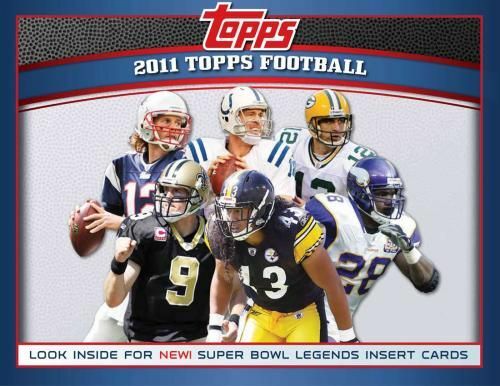 At DeansCards.com you can pick up all your 2011 Topps Football singles to complete that set or team set. And hey, if you're a little behind, check out what we have in stock for 2010 Topps Football Cards. Also, Dean's Cards has an extensive vintage football card offering. You can pick up tons of cards from your favorite player or team. Here is the checklist for 2011 Topps Football.